So, we do a lot with Upwork via VA’s and developers for the PBN HQ site, marketplace and, in particular for 2016, bringing on Domain Ronin as the PREMIERE expired domain crawler in the business. We have to say that we have had great success in finding competent, communicating, hard-working freelancers on UpWork and we’re confident that it has to do with our hiring/vetting/communication processes. You won’t always find great contractors, freelancers and VA’s on UpWork but we are positive that if you’ve take what we’ve learned and implement them in your own businesses then you can expect and easy time of getting everything to work out in your favor. We like to explain and draw out exactly what we want almost to the point obsession. One thing we agreed upon early in the year was that the more definitive we can be in our instructions then the easier it would be to identify freelancers that we wanted to work with and then weed out those who couldn’t follow directions. We worked very hard on writing out detailed instructions and making videos that walked our VA’s through the domain spam checking process. It was a lot of time investment but in the end we think that it really helped us and our VA’s know exactly what we wanted. Another thing about the written SOPs and the videos is that they were pretty green, in that when we wanted to hire additional VA’s then all we needed to do is send them a Dropbox link with instructions, screen shots, and links to our training videos. Lastly, if we felt that there was some “slippage” in the detail and accuracy of the work that the Va’s were doing then we could always refer them back to the SOPs and videos. Once you’ve identified a few good VA’s that you’re comfortable with and have the processes down then we found that the best way to hire additional help is to have your current VA’s talk to their friends and ask them to come on board. We encourage all of our VA’s to use Skype and then we start a new conversation with Steve, Doug, Ken and all of the VA’s that we have hired for a particular task. This also goes for the developers. Some will code and some will design. We had separate Skype chats for coders and developers and once we were confident that everyone was on board and understanding the project we actually brought them together in another Skype chat and it was like the heavens opened. We had brilliant people on all sides brainstorming, formulating, and focusing on tasks the perfect plan to get everything done with awesomeness. We can put out new guidance en masse without having to hope that they all saw it. Communication amongst the VA’s and ourselves actually servers to train everyone on the processes simultaneously. We public acknowledge birthdays and holidays to make everyone feel they’re part of the team and appreciated. When looking for developers in order to get Domain Ronin and a lot of the marketplace and free tools online, Steve and Doug did a TON of interviewing. I mean they committed a lot of time to truly vetting and understanding just exactly what the developers that they hired knew and could handle. The most important thing they were looking for, aside from ability, was honest communicators with initiative. Despite what Steve and Doug think and having technical backgrounds…they actually DON’T know everything. (Ooh, burn!) Particularly when it came to coding. They still provided the developers with very detailed instructions in video, written out, and live Skype chat formats but they mostly wanted someone with more knowledge than they have to actually stand up and say “Hey, wait, guys…this wrong” OR “There’s actually a better way of doing this.” What they had found in some cases-in the past-were great, competent people who would follow the directions without fail instead of actually being creative and improving upon a concept that could be better. We now have a full time team of high quality developers who can implement anything we need with very little involvement from us. Of course there are always bugs to squash, but from idea to implementation is sometimes the hardest part. Our lead developer is in charge of the team. We do most of our communication with him, he assigns tasks or bug to individuals within the team, then does code reviews on the solutions they complete. This way we’re getting more work completed and at the higher standard of the lead developer. The lead developers pay rate will be higher, but he should be less hands on this way. Starting a friendly competition amongst your VA’s will catapult production. I.E. “The first VA who works through their domain list with less than 3% disapproved domains by the admin will receive an extra $25”. This increases production while at the same time ensuring that the quality of work doesn’t go down just so they can make an extra few bucks. UpWork has some great visual tools that helps you to know who is logging on and looking for work and who isn’t. If you have a VA that isn’t giving your project that much attention then reach out once, if they still aren’t motivated to work then cut them loose. You have more important things to do then chase down freelancers. Make it clear from the beginning that you expect your freelancers to be individually minded and show some initiative. A lot of those guys and gals have been burnt by moody, demanding, jerky people who have hired them in the past. We found that you need to run your VA pools as an actual work force rather than disposable lackeys in order to get any real kind of dedication and loyalty to the project. BLUF: Treat them like employees (actual human beings) with respect and reward a great job and you and your project/business will be much better off for it. 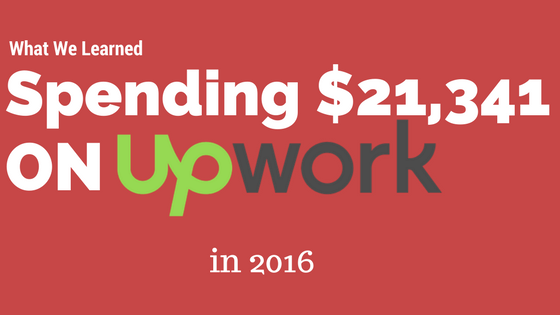 You’re not always going to find super star freelances on UpWork or any of the other freelance banks online. However, with some hard work, preparation, and treating them like human beings who are expected to get a job done and then rewarding them for a great job, we feel that you’ll have GREAT success in using UpWork and the likes for your business. We have had great success in building our business with great developers and VA’s because of all the above. We simply offer these ideas to you as a guide. Take Care, and good luck with your business!